It may seem unusual that this book is published in two digital formats: one housed on the Sweetland Digital Rhetoric Collaborative (DRC) website in its original webtext design and the other published as an enhanced pdf for the DRC book series with the University of Michigan Press. However, this choice is rhetorical and strategic. By publishing the text in two formats, we hope to take full advantage of the opportunities that digital publishing with a university press allows. By publishing a version with the DRC Sweetland Press, we were able to preserve the design intended by the collection’s authors. 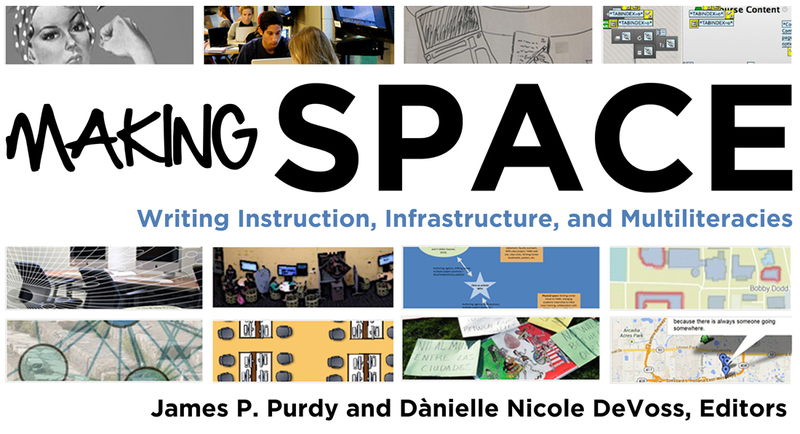 Authors of the collection’s chapters put in long hours and hard work imagining chapters for which the interfaces, visual features, and design elements all contributed to the rhetorical concept of making space–in this case, making aesthetic, visual, content-anchored space for their ideas. It was, therefore, important to us to respect and preserve their decisions in the digital publication of the text, particularly in a collection that argues for the value and importance of seeing the spaces of our learning, teaching, and research as the product of deliberate infrastructural decisions that impact our work. Publishing on the DRC site allowed us to do that. At that same time, we wanted a version of the text that would be preserved and maintained long term in a more stable space. Thinking about the future accessibility of the text made particular sense for a collection about the spatial infrastructures of teaching and researching writing. The long-term sustainability of our teaching and research spaces remains an important need and consideration, and we became increasingly aware that publishing in such a way that recognizes that need allowed us to begin to enact the kind of attention to sustainability for which our project calls. It also led us to consider how our design decisions are not always sustainable in the ways we want. We also wanted the project to have the imprimatur of a university press–for all of the reasons that such an imprint is important, including editorial support and tenure and promotion expectations. Publishing on the University of Michigan servers allowed us to accomplish those goals. Digital publication also offers an opportunity to make more visible the work of academic publishing. Too much of the academic publishing process remains invisible. The too-often-invisible labor in print publication includes the copyeditors, typesetters, and designers. While desktop publishing and web-authoring programs have made these activities more visible to writers/authors, they still remain largely invisible to readers. The too-often-invisible labor in digital production includes coders, developers, testers, and usability coordinators. We want to acknowledge that invisible work here: We worked with Phill Alexander (a faculty member/researcher/coder at Miami Ohio), who helped us to code the overall container for the webtext, and with Annie Sommer (a usability and accessibility specialist at Michigan State University). We owe Phill and Annie big thanks for their contributions to this project. We also owe big thanks to Anne Gere, Naomi Silver, and Aaron Valdez of the DRC and Mary Francis, Marcia Labrenz, Jeremy Morse, and Christopher Dreyer of the University of Michigan Press for supporting the project. We are particularly grateful to Anne, Naomi, and Mary for giving us the opportunity to publish Making Space in both venues. We, finally, welcome readers to the two, cross-published versions of the text, and we encourage you–as part of the space and place of the text–to consider the shape, flow, feel, and other elements of each version of the text. We hope that you, as we do, engage the considerations of textuality in digital spaces and embrace the different representational contexts and opportunities the two formats allow.